Sarah J. Maas’ best-selling Throne of Glass book series is headed to television. Hulu is developing Queen of Shadows, an epic fantasy adventure TV series based on the books. Kira Snyder (The 100) will write the adaptation, with Anna Foerster (Underworld: Blood Wars) set to direct the potential pilot episode. I’m a huge fan of this book series, so obviously I’m super excited about this news! And also a little nervous, because book adaptations can be so, so tricky and I really hope they will do this story justice. Greg Berlanti will be directing Fox 2000’s adaptation of Simon vs. the Homo Sapiens Agenda. He is best known for his tv work, including Dawson’s Creek, Brothers & Sisters, Arrow, The Flash, Supergirl and Legends of Tomorrow. Described as a coming-of-age coming-out story, the plot of Simon vs. the Homo Sapiens Agenda centers on a high school junior named Simon whose sexual-orientation secret falls into the hands of the class clown. The latter blackmails the teen into playing cupid and while that unfolds, Simon tries to navigate a way that will let him come out to his friends and family, not pushed out. Wyck Godfrey and Marty Bowen of Temple Hill are producing the adaptation of Becky Albertalli’s YA best-seller along with Pouya Shabazian. First of all, I was not yet aware that Simon was being made into a movie, so this is already awesome news in itself! But then to know that Greg Berlanti will be directing it is even better – I’m sure it will be in good hands! Early September, C.S. 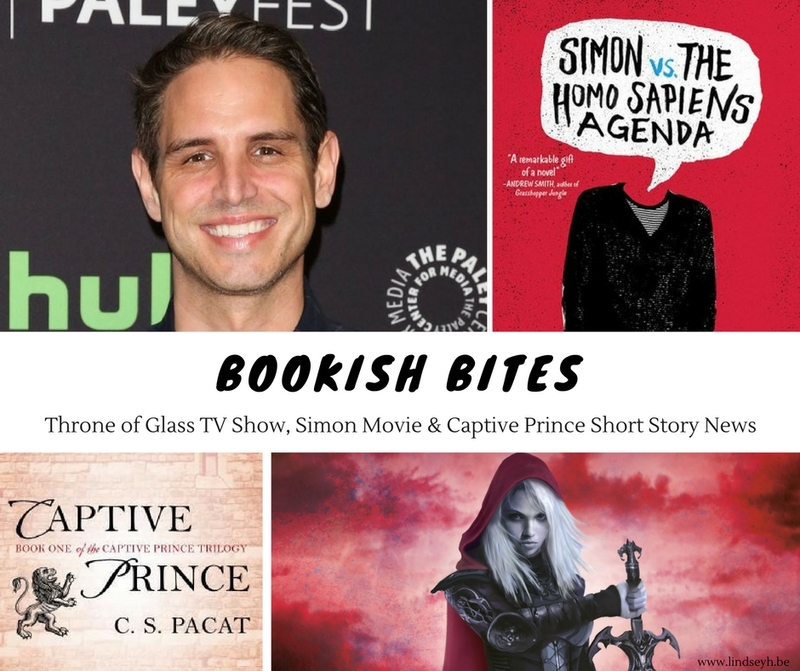 Pacat revealed some news on two of her three Captive Prince short stories. Captive Prince is a trilogy set in a Roman/Greek inspired setting, where Prince Damen is captured, stripped of his identity, and sent to serve the prince of an enemy nation as a slave. The first of 3 Captive Prince short stories, called ‘Green But For A Season’, will be released on September 20th and is now already available for pre-order. It follows the relationship between Jord and Aimeric and is set during the events of Prince’s Gambit. The second Captive Prince short story is also revealed to be called ‘The Summer Palace’. It will be an epilogue of sorts to Kings Rising and will focus on the characters of Damen and Laurent. Totally understood, I’m super nervous about the Simon movie as well! It’s one of my favorite books so I hope they do his story justics. And yes, especially the amazing characters <3 But Greg Berlanti has worked on some of my favorite shows, so I have high hopes 🙂 Now I'm just super curious to find out who will be cast! Oh it’s going to be on Hulu?! I need a Hulu subscription when it comes out. I only read ToG and frankly, I don’t plan on ever reading the books. But I’d totally give the tv show a try and who the cast will be. There’s going to be a Simon movie?! I need to read the book then! Thank you for sharing these news! I think TV shows are even trickier most of the time than movie adaptations, so I’m very anxious for the ToG tv show. Definitely do hope you’ll enjoy Simon, it’s one of my faves! oh I’m always nervous about book adaptions because I expect it to be word-for-word like the book and also 12hours in length. Hulu has been doing awesome things lately and I’m stoked for their Handmaid’s Tale adaption, so hopefully this is just the beginning of the adaptions they want to do! I heard about The Handmaid’s Tale, will have to read that one soon!